Along with all my boots, I have quite a few knee socks- I can never understand how some women can wear boots with no socks (with the exception of Uggs). (You know who you are!) 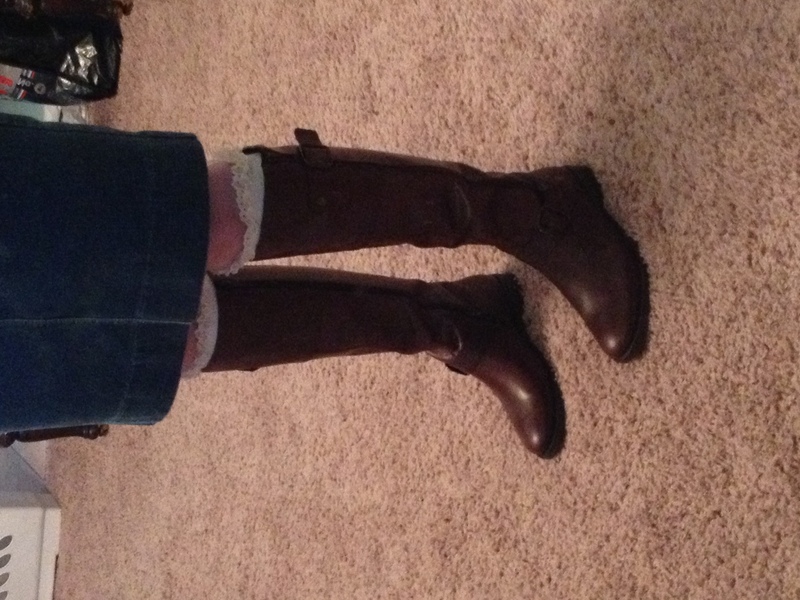 So of course when I got these new riding boots I decided I needed some new socks. I found a couple of pairs but I wanted something kind of girly and fun, so I decided to perform some simple DIY magic on a plain beige pair. I found some matching beige lace in my stash from going to yard sales over the summer and some thread and starting sewing near the top of the socks. Yes I do have a sewing machine but since I assumed this was a quick and simple task, I decided to use the old sew-by-hand method. However it didn’t end up being quite as quick and easy as I thought. I finished one entire sock before I tried it on and then I couldn’t even get it over my foot! DUH! I forgot to stretch out the sock while I was sewing, since the lace I was using didn’t have any elastic in it. 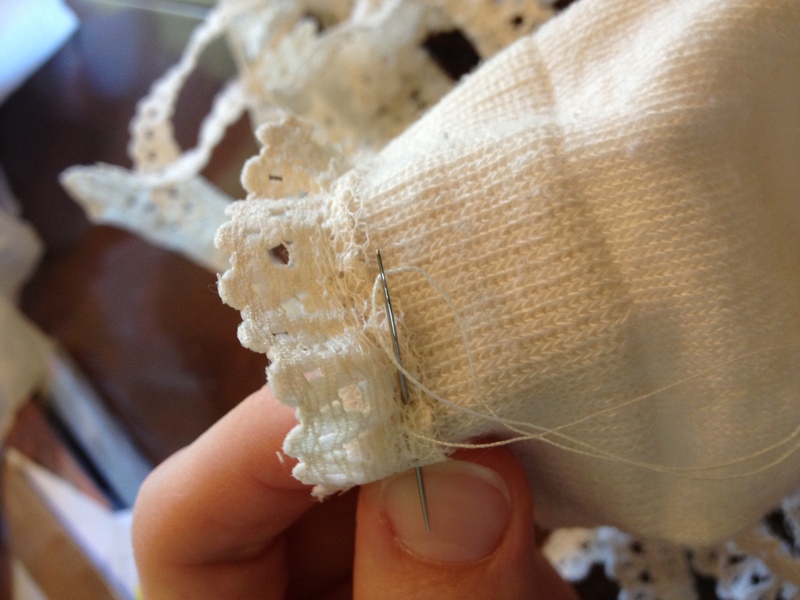 So I had to rip out all the seams and start over…. blah. So what’s the best way to make sure it would fit? 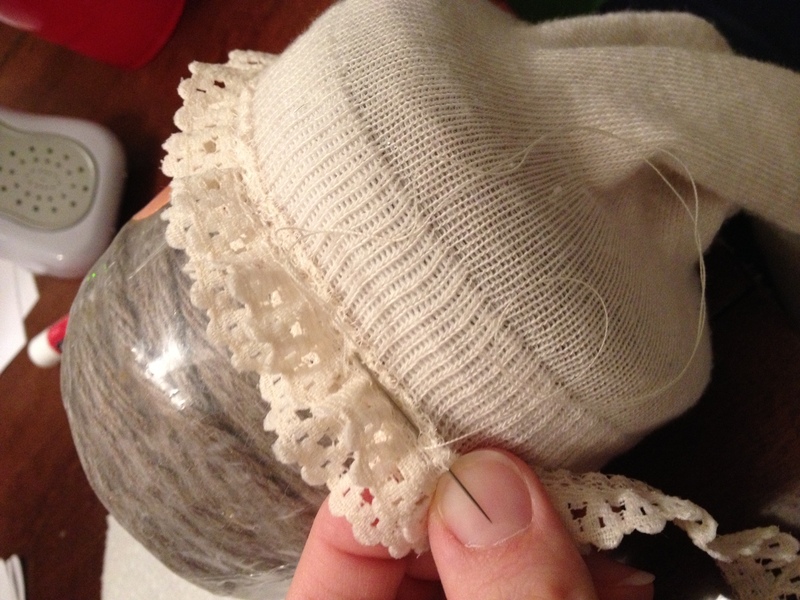 I figured I should wear the sock while I was sewing the lace on…. LOL. Not the worst idea but definitely not the most pain-free option, either! After I poked myself a couple times I realized I could use something else that was similar to the circumference of my calf to make this sewing job easier. I found a package of twine that worked just fine. I also decided to sew two rows of lace instead of one… and in a way it reminds me of the fancy socks I wore to church as a little girl with my mary janes- but more grown up of course! Here is the final result with my new birthday boots… they might be simple but I think it’s the little details that sometimes make the biggest differences. 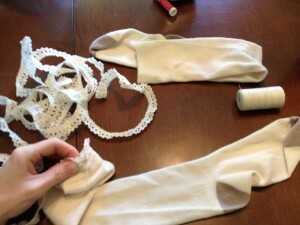 That is something I would totally do – sew with the socks on my body! I just got new boots too and have been contemplating making some fake socks (just the top 4-5 inches) with old sweater sleeves. P.S. I do wear socks with my boots – just not ones you can see. P.P.S. I’m a member of The Forum too – welcome to blogging! Oh, that looks great with the added lace!! 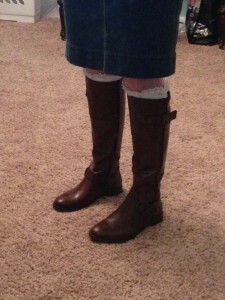 I went and got a sweater from the thrift store and cut off the arms to “make” my boot socks (I don’t sew…). ah, nobody knows that I’m wearing parts of a sweater on my legs! Haha… well now there’s at least one person who knows – Great idea!